A Mighty Big Country – Let's Go Be Great! I am on holiday this week driving from Seattle, Washington to Washington DC with my family. This is an annual trip for me and some of my best thinking and reflection occurs during these holidays. In addition to the family trip every year, I’ll occasionally do a solo cross country trip to really get away and think (and stop at some of my favorite BBQ joints along the way). For those of you who don’t know the book, Randy was asked to give a lecture and share his wisdom and perspective a month after receiving a terminal cancer diagnosis. It is a heartwarming, albeit deeply emotional book given his circumstances. The main point of the book and his lecture, is that your dreams and aspirations matter and that setting yourself on a course of achieving those dreams is the cornerstone of a life well lived. As you achieve your dreams you can then focus on enabling the dreams of others. His book had a profound impact on me and has changed the way I live my life. Among them is that I wanted my work to be a source of meaning for me, not necessarily a place that provides me a sense of self-esteem but a place where I can serve a purpose greater then myself. A big part of the process for me taking inventory of my dreams and what I’d like to be a part of … only after that, did I begin framing out what we’d do and how we’d do it …Tahzoo is culmination of several dreams for me. I believe in great customer service. I can think of very few things as satisfying than taking great care of a customer. I often tell people that waiting tables was one of my favorite jobs because I got to create a wonderful evening for my customers. 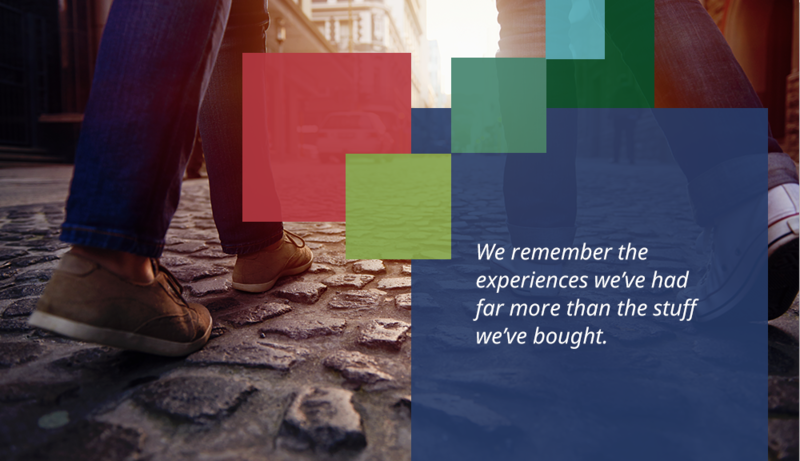 We remember the experiences we’ve had far more than the stuff we’ve bought. The web has made the world more efficient, but mostly at the expense of the experience- let’s change that! I wanted to a build a company that I could take pride in the way that it impacted the lives of others. In our case it’s that we should help our clients deliver an experience that makes their customers happy. We can be responsible for creating millions of pleasant moments everyday… that possibility makes me happy. I believe that in order for Tahzoo to be a great company we need to take great care of one another. I have been fascinated with how people work together since I was a boy. I have been fortunate to be on several great teams in both sports and in business, I have found this experience so compelling, so profound, that I’ve spent most of my adult life seeking to be a part of or helping to create great teams. Every great team that I have been part of has had one common thread… a high degree of trust and commitment to one another. I see pockets of this at Tahzoo but not nearly enough to feel like we’ve got it figured out. The irony is that a great company is a byproduct of the people… not the actual company. I need your help and your commitment to making your team a great team. I want Tahzoo to be a platform for all of us to learn and change. We have the opportunity to solve really interesting problems, explore different aspects of our thinking and ideas, all while helping our clients be successful. One of the things that appealed to me was the idea that if we worked on leading edge problems, we could get paid for doing cool stuff. The interesting challenge I am working on is how do we create a company that encourages people with different backgrounds, disciplines and perspectives to work together collaboratively on behalf of a customer? See it’s so much easier to hire a bunch of likeminded people and ask them to work together, however; the best companies, leading 21st century companies are the ones that bring many perspectives together… the best results and decisions are made by teams that work all sides of an issue. That’s an example of how I see Tahzoo as an opportunity for me to explore how to do something better. What is the idea that you’re working on? How are you seeing your time at Tahzoo as an opportunity to explore and deliver a big idea? In any event, I thought I should share with you how I got here, how we got here. I decided these dreams of mine were too important to just think about or to hope that one day they’d come true. I set out on a course of action to make them happen. I am not done yet and there are more dreams to be shared and pursued. I hope in some way this inspires you to participate in my dreams and I hope that Tahzoo is a place that can enable your dreams. It can be as simple as just being a great place to go to work every day or inventing the next generation of human to computer interfaces … either way it’s up to you. Tahzoo has a remarkable future in large part because of all of you. I am so proud to be a part of this company. ← Hi … (insert customer name here) how can I help you?